Upon your arrival, our guide will pick you up at the airport or bus terminal, and take you to your hotel. We will see the finest collection of gold and silver from ancient Peru. The Larco Museum showcases remarkable chronological galleries providing an excellent overview on 3000 years of development of the pre-Columbian peruvian history. Surrounded by beautiful gardens, it is located in a unique colonial residence of its kind, dating from the eighteenth century, which was in turn built on a pre-Columbian pyramid of the seventh century. 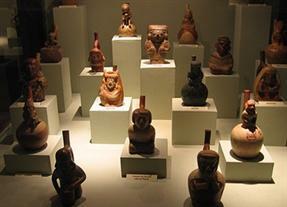 The artworks of the Larco Museum are considered icons of pre-Columbian art worldwide. The collection of the Larco Museum has been seen by over 5 million people through exhibitions in the most prestigious showrooms, museums and cultural centers of the world. We will see Lima and its three historical periods: Ancient, Colonial and contemporary. Ancestral Lima:We begin our tour with a panoramic view of the "Huaca Pucllana", magnificent ceremonial and archeological center built in the fourth century AD and considered "Holy People" by the Incas. Colonial Lima: The Viceroyalty of Peru was the most important of the Spanish Empire and Lima was its capital. We visit the Historic Center of Lima, where you will appreciate more than fifty monuments and colonial buildings, highlighting the Paseo de la República, Plaza San Martin, Plaza Mayor, the Government Palace, the Archbishop's Palace, the Cathedral, the City Hall among others. We also visit the San Francisci monumental complex, which is the largest exhibition of colonial religious art in America. After that we will go to its subterranean crypts known as "Catacombs". Contemporary Lima: We visit the most traditional residential areas of Lima, El Olivar de San Isidro, Miraflores and Larcomar. Flight from Lima to Cuzco. 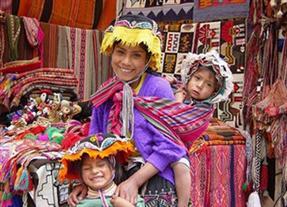 Upon arrival, we transfer you to your hotel in Cuzco. Time to relax and get used to the altitude, and explore the city. 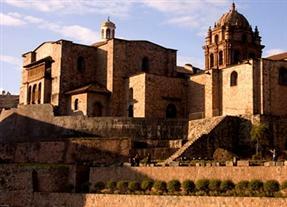 The Qoricancha (Temple of the Sun), was and is one of the most respected temples in the city of Cusco. It was a sacred place where they worship the Sun (Inti), the main deity for the Incas. Before the arrival of the conquerors, the Temple had its walls decorated by a continuous band of pure gold. The present Church of Santo Domingo was built over the original incan temple in order to evangelize the natives. Then we visit The Convent of Santo Domingo, the Cathedral and the Main Square. Sacsayhuaman, one of the most impresive incan complexes. Built with stone blocks wonderfully united, that protect the city. The main wall is formed by stones measuring up to 5 meters high and 2.5 meters wide, and can weigh between 90 and 125 metric tons. Move these stones was a real challenge, but so was the perfect fit between them and the care put into the curvature of the pads. Qenqo, the interest of this place lies in two aspects: the originality of its construction, since it is a huge rock carved with different symbols of the Andean people, and the closeness to Sacsayhuaman. Qenko is known as a Labyrinth, because of the multiple tunnels and galleries. Tambomachay,was one of the pillars of the defensive system of the Cuzco valley. It consists of a set of structures finely carved in stone, aqueducts and water falls from the springs and hot springs nearby (so you think it was related to the worship of water). The sound of the water in the place, the tranquility and peace of the rooms and the shape of the space in which it was built, give Tambomachay a peculiar atmosphere. Besides is a great example of the ability of the Andean architects to harmonize their constructions. Pukapukara, which means "red fortress", because its limestones acquired a reddish coloration due to the abundant iron in the land. It was a "pukara", which is a small fortified construction which function was to protect Tambomachay, a very important inca palace. Its main function was to more administrative control than militar. This site is composed of a small square rooms and two walls that hold a roof terrace. By where it is located, it has visual domain of the zone, it must have been, besides a monitoring and control center, a gateway to Cusco from the Antisuyo. 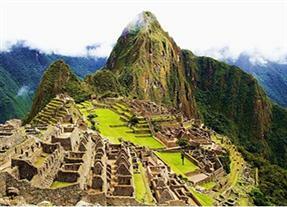 We will take a train to Machu Picchu, the wonderful Inca citadel. During the trip we will travel along the Vilcanota river and the mountains, enjoying a magical landscape. When we start changing from the Andes to the the Upper Amazon rainforest region, then we know we are closer to the great Machu Picchu. We arrive at Aguas Calientes town, from where we take the bus which will take us to Machu Picchu. Once in Machu Picchu, we explore the citadel, and go through the different rooms and areas, like the Intihuatana (Sun Stone), the Sun Temple, The Sacred Stone, and the Room of 3 Windows. Time to explore the citadel and take pictures. After our visit we go back by train to Cuzco. Today we will explore the beautiful Sacred Valledy of The Incas. We will vist the the Pisac town, here will walk around the indigenous market, where we find beautfiul handycrafts, fruit, and food. Then we go up to the Pisaq Incan ruins on the hillside from where we get a great view of the town. There is an strange coincidence between the distances that unite the cities of Pisac, Cuzco and Pikillacata. The distance between Cusco and Pisac is 30km, it is the same distance if measured at Pisac and Cusco Pikillacta Pikilacta are equally 30km. By joining with straight line these three cities, a perfect equilateral triangle, which creates multiple speculation about the incredible architectural genius that the Incas had achieved. Following our visit, we continue and pass through the towns of Coya, Lamay, Calca, Yucay, and Urubamba, observing beautiful flora and fauna during the route that takes around 45 minutes to Urubamba village for lunch in a cozy restaurant. Next, we will visit the amazing Ollantaytambo fortress. It was a fortified city built by the Inca Pachacutec and at the time of the conquest served as a fortress for Manco Inca Yupanqui. The city was formed as a military, economic and administrative and agricultural complex. Ollantaytambo was also an important "tambo" or city with houses, huge food stores, and places for astronomical observation. Transfer from your hotel to the airport. Flight from Cuzco to Lima. Transportation with AC and professional driver. 02 nights accommodation in Lima with breakfast included. 04 nights accommodation in Cuzco with breakfast included. 24 hours assistance during the trip. Other meals or expenses not specified above.